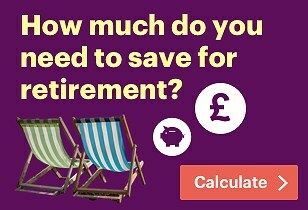 What will stop another pension disaster like Carillion? 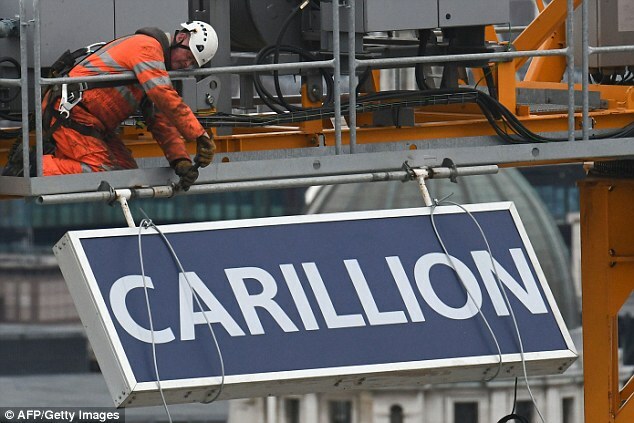 The pensions watchdog has come under fire as MPs issued a damning verdict on the collapse of Carillion, which has led to 27,000 of its former staff getting reduced retirement payouts. The construction firm’s former bosses get the most blame for the fiasco, including the £2.6billion black hole they left in the pension scheme. But MPs’ scathing report also states that they have ‘no confidence’ in the Pension Regulator, and they are unconvinced the current leadership is equipped to change its ingrained ‘tentative and apologetic’ approach. Carillion workers’ pensions will be safeguarded by the official lifeboat scheme, although they will get lower payouts than promised by their disgraced former employer. The Pension Protection Fund which came to their rescue has taken a £800million financial hit, its worst ever, although it has large reserves that should be enough to absorb this blow. So what went wrong at Carillion, and what do MPs say should be done to prevent other firms recklessly starving their pension schemes of cash? What happened to Carillion’s pension scheme? The construction firm’s acquisition spree in earlier years meant it ended up holding responsibility for a total of 13 final salary schemes, 11 of which are thought likely to need rescue. Read more here on what workers will get now. What does The Pension Regulator say? Chief executive Lesley Titcomb said in response to the MPs’ report: ‘We actively seek to learn lessons to better protect members of pension schemes. ‘In the past the balance between members and employers was not always right. The report underlines the significant changes already made at TPR but there is more work to do. “We are now a very different organisation; we are clearer about what we expect, quicker to intervene and tougher on those who do not act in the interest of members. ‘We have reinforced our regulatory teams on the frontline and are embedding a new regulatory culture. Final salary pensions are typically generous, and provide a guaranteed income to workers from retirement until they die. But they are often seen as an expensive burden by employers, which are obliged to fund them unless they go bust themselves. Carillion’s schemes were closed to new members, so some of its workforce belonged to a modern auto-enrolment ‘defined contribution’ pension plan run by BlackRock. These staff save into individual pension pots wholly owned by them, which weren’t affected by the firm’s demise. MPs say Carillion’s bosses failed to address mounting final salary pension deficits in the years running up to its collapse, and successfully fought off attempts by trustees and The Pensions Regulator to make higher contributions or come up with a more sustainable recovery plan. They accuse the board of raising dividend payouts to investors every year, but refusing to link such rises to pension contributions and up them in line with each other. The key regulators, the Financial Reporting Council which oversees auditors and The Pensions Regulator, were ‘united in their feebleness and timidity’, say MPs. The report notes that Carillion’s former directors were not members of the final salary pension schemes, and they received generous employer contributions to a defined contribution scheme – for example, £231,000 and £163,000 went into the pots of two of the top bosses in 2016. ‘Honouring pension obligations over decades to come was of little interest to a myopic board who thought of little beyond their next market statement. Their cash chasing acquisitions policy meant they acquired pension scheme deficits alongside companies,’ say MPs. 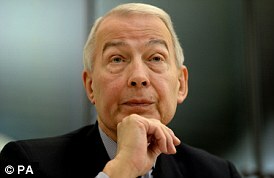 What does influential MP Frank Field say? ‘Same old story. Same old greed. A board of directors too busy stuffing their mouths with gold to show any concern for the welfare of their workforce or their pensioners. ‘They rightly face investigation of their fitness to run a company again. This is a disgraceful example of how much of our capitalism is allowed to operate, waved through by a cosy club of auditors, conflicted at every turn. ‘Their proposals for funding those deficits were consistently and resolutely derisory as they blamed financial constraints unrecognisable from their optimistic market announcements. MPs say the pension scheme trustees were ‘outgunned’ and ‘largely powerless’, and when it was clear that the company was refusing to budge an inch, they turned to The Pensions Regulator to intervene. What is MPs’ verdict on pension watchdogs? The Pensions Regulator’s response to the underfunding of Carillion’s pension schemes was to threaten to force the firm to pay contributions, a power it had never and has still never used, say MPs. They point out that the regulator ‘congratulated itself’ on a small uptick in recovery plan contributions after one negotiation with the firm, but claim this only highlighted to both sides how unequal the contest would continue to be. ‘TPR failed in all its objectives regarding the Carillion pension scheme. Scheme members will receive reduced pensions. The Pension Protection Fund and its levy payers will pick up their biggest bill ever. Any growth in the company that resulted from scrimping on pension contributions can hardly be described as sustainable. ‘Carillion was run so irresponsibly that its pension schemes may well have ended up in the PPF regardless, but the Regulator should not be spared blame for allowing years of underfunding by the company. What does the auditors’ watchdog say? ‘The Financial Reporting Council is a strong, transparent regulator which makes full use of its statutory powers and innovates, for example, by introducing audit retendering and most recently an extended audit inspection regime,’ says the watchdog. MPs question this belated move against Carillion, saying: ‘TPR had concerns about schemes for many years without taking action. ‘There are also no valuable assets left in the company, and while individual directors were paid handsomely for running the company into the ground, recouping their bonuses is unlikely to make much of a dent in an estimated pension liability of £2.6billion. What will happen now to protect other pensioners? They suggest the Government has not gone far enough to prevent a repeat of the disaster, and urge it to go further in clamping down on errant firms, and pushing ‘chronically passive’ watchdogs to take a tougher stance. ‘The collapse of Carillion has tested the adequacy of the system of checks and balances on corporate conduct. It has clearly exposed serious flaws, some well-known, some new. ‘We have no confidence in our regulators. FRC and TPR share a passive, reactive mindset and are too timid to make effective use of the powers they have. How is Carillion linked to infamous BHS case? MPs say that BHS, the other major corporate collapse they recently considered, was also characterised by long-term underfunding of pension schemes. ‘But the BHS case was different – the foremost concern in that case was the dumping of pensions liabilities through the sale of the company. But MPs say that although the Government has recognised regulatory weaknesses, its responses have been ‘cautious, largely technical, and characterised by seemingly endless consultation’. Meanwhile, MPs themselves have already looked into ‘problematic major schemes’ and the long term funding of pensions, and they have flagged the potential risks of corporate sales – including the pending deal involving Sainsbury and Asda. They have welcomed the Government’s pledge to make TPR ‘tougher, clearer, quicker’, an additional £3.5million of funding for the watchdog this year, and the latter’s moves to prioritise more proactive work. However, the MPs’ report adds: ‘The case of Carillion emphasised that the answer to the failings of pensions regulation is not simply new powers. The Pensions Regulator, and ultimately pensioners, would benefit from far harsher sanctions on sponsors who knowingly avoid their pension responsibilities through corporate transactions. ‘But Carillion’s pension schemes were not dumped as part of a sudden company sale; they were underfunded over an extended period in full view of TPR. ‘TPR saw the wholly inadequate recovery plans and had the opportunity to impose a more appropriate schedule of contributions while the company was still solvent. ‘Carillion’s rise and spectacular fall was a story of recklessness, hubris and greed,’ say MPs in their report. ‘Its business model was a relentless dash for cash, driven by acquisitions, rising debt, expansion into new markets and exploitation of suppliers. ‘It presented accounts that misrepresented the reality of the business, and increased its dividend every year, come what may. ‘Long term obligations, such as adequately funding its pension schemes, were treated with contempt. Even as the company very publicly began to unravel, the board was concerned with increasing and protecting generous executive bonuses. What does the pension industry say? Nathan Long, senior pension analyst at Hargreaves Lansdown, said: ‘The report is highly critical of the corporate culture which led to Carillion’s collapse and to the watering down of thousands of workers’ pension benefits. ‘Defined benefit [final salary] pensions are only as strong as the company that backs them, which is why confidence in the strength of the Pension Protection Fund is so unbelievably crucial to a well-functioning pension system. ‘The Pension Regulator has coped admirably with the enormous task of bringing in ground-breaking auto-enrolment rules to revolutionise the way we save for retirement. This heavy workload does not absolve them from stinging criticism from the Work & Pensions Select Committee for allowing the Carillion pension schemes to be hollowed out on their watch. ‘Referring to the regulator’s challenge as like a “paper tiger” tells you all you need to know about how effective the committee perceive them to be. ‘Stopping short of a recommendation to disband the regulator, findings that a “tentative and apologetic” approach is ingrained at the regulator, and with doubts about the current leadership, suggest that the intense scrutiny will continue at least a little while longer. ‘The proposal for a closer working relationship with the Financial Conduct Authority looks timely and may help deflect some of the heavy fire. Ian Browne, pensions expert at Old Mutual Wealth, said: ‘The Work and Pensions Select Committee is far from subtle in its final report into Carillion’s collapse – it was, in no uncertain terms, a disaster. ‘The report reveals the executive of Carillion did not act in the best interest of their employees and acted against recommendations of best practice. ‘The report is equally blunt with its assessment of The Pensions Regulator. Companies and their directors need to be terrified of the wrath of the TPR, something the committee feel is far from the case currently. ‘Indeed in 13 years of defined benefit scheme regulation, TPR has issued just three Warning Notices relating to its section 231 powers, and has not seen a single case through to imposing a schedule of contributions. So there is some merit to this criticism.